The economic loss from damaged tubers can be very high. Protecting tubers against damage is a challenge for all potato growers. A damaged tuber can not only become diseased, but it can also spread disease to other tubers, even in cold storage, and that can make an entire harvest hard if not impossible to market. Disease can enter a tuber through skinning, bruising or cutting. These wounds encourage the spread of serious and common storage diseases like bacterial soft rot (Erwinia carotovora), late blight (Phytophthora infestans), Fusarium dry rot (Fusarium spp. ), Pythium leak (Pythium spp. ), pink rot (Phytophtora erythroseptica) and silver scurf (Helminthosporium solani). The economic loss from damaged tubers can be very high. For example, if potatoes are selling at $15 per 50lb. unit or $600 per ton, and you have 1,000 tons of potatoes, you could lose $60,000 if 10% of them are unmarketable. From what I have seen, 10% damage is not uncommon, and damage has certainly been much higher from some fields. Besides the unmarketability of damaged tubers, there is the added labour cost for sorting to ensure that shipments aren’t rejected. People like perfect looking potatoes and if tubers are damaged or diseased you can lose consumer trust. Fortunately, there are a number of ways to mitigate bruising, even before planting. As much as possible, growers should choose fields with minimal compaction, suitable water holding capacity, and consistent planting depth and drill profile. The soil should be managed carefully throughout the season to ensure 60% to 65% moisture at harvest. Ideally, appropriate machine cultivation should occur in the fall to break up hard pan and in the spring when the soil has sufficiently dried out to stop clods from forming. Also, traffic in the field should be minimized to reduce clod formation. Sandy soil will often cause damage to susceptible varieties because of roll back on the primary chains, so planting less susceptible varieties in those fields may reduce damage. These include Dakota Pearl, GemStar Russet, Red La Soda and Agata. Seed tubers need to be handled carefully because any bruises created during cutting, transporting or seeding will make the tubers susceptible to diseases, which can lead to poor emergence or growth. There are a number of ways to mitigate bruising, even before planting. 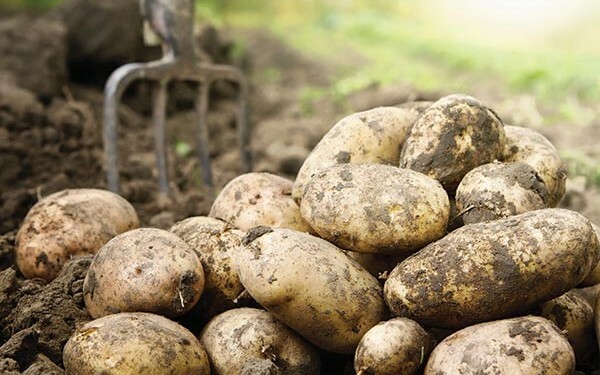 Potato plants need sufficient amounts of potassium and calcium, as some studies have shown that deficiencies in these nutrients can make tubers susceptible to bruising. Care must also be taken with nitrogen levels because too little can cause plant stress and minimize growth, whereas too much can lead to delayed maturity, poor skin set and susceptibility to bruising. At planting, soil temperature at seeding depth should be at least 9°C (48°F), and tuber pulp temperature at harvest should minimally be 7°C (45°F) but ideally between 10°C to 16°C (50°F to 61°F). Guarantee vine kill 10 to 14 days prior to harvest, but keep in mind that in wet, clay soils, skins may take longer than two weeks to set. At harvest, growers want to align rollers and digging blades so that they do not crush or cut tubers. Belts should be adjusted based on ground speed and to optimize soil flow up the primary chains to reduce roll back and minimize soil entry into the truck. When storing, tubers should be put into a pit in a step like fashion, and tubers should ideally be warmed to 7°C (45°F) before handling for grading or processing. For equipment-handling tubers, drops should be kept below 15 cm (6 inches), equipment should be padded where necessary and run at full capacity, and all staff should understand the importance of minimizing bruising. By carefully following best management practices and learning where specific operational improvements can be made, damage to tubers and subsequent problems can be minimized.